Joni Mitchell may have been Canadian but, like fellow Canuck Neil Young, she was also the archetypal Laurel Canyon troubadour, at least at this point in her career. But there was always a sense that she was apart from any putative scene, reflecting on rather than immersed in it – even her famous, eponymous song about Woodstock, penned just after the legendary rock festival, had a ruminative, even sorrowful quality about it, as though she was contemplating a moment that had passed, gone forever. 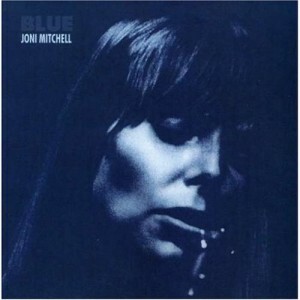 And so it is with Blue, Mitchell’s fourth album. It has, as the title suggests, a melancholy atmosphere, one that functions on two levels: one personal, the other universal. It feels as much like the diary entries of a woman written in the wake of a breakup as it does a more general statement about a generation reeling after a series of shocks (Altamont, Manson, RIP the Fabs). Blue evokes the mourning after the nights of free-love before. If The Beatles’ split was symptomatic of the failure of the youth to come together, Blue felt like the net result. Orphaned by the death of the hippie nation, Mitchell was left to ponder a future alone, minus the comfort of community. Blue introduced a new paradigm for rock: the solo singer-songwriter confessing her woes, making her way in the world alone, without the solace of a band. Blue invites such fanciful commentary. It feels like poetry set to music, and even though many of the lyrics are simple (“All I really, really want our love to do is to bring out the best in me and you,” from the opening track All I Want), often the music seems to be accommodating the words. As a consequence, the melodies, tracked by Mitchell’s swooping, soaring vocals, can be so hard to follow that it’s almost a miracle anyone can remember them, let alone the artist.he death of the hippie nation, Mitchell was left to ponder a future alone, minus the comfort of community. Blue introduced a new paradigm for rock: the solo singer-songwriter confessing her woes, making her way in the world alone, without the solace of a band. And yet that’s exactly what did happen: these songs became indelibly stamped on the minds of Americans and young people everywhere, isolated and bewildered at the start of a new decade. Carey (which was, tune-wise, Big Yellow Taxi’s slight return), the title-track and The Last Time I Saw Richard may have been highly personal, with speculation that they were about, respectively, former beaus James Taylor, David Blue and her ex-husband; A Case Of You may have been as private as a love letter; and Little Green, about giving up a child for adoption, may have been excoriating autobiography. Nevertheless, these songs, sparsely arranged on piano, acoustic guitar and Appalachian dulcimer, delivered with a jazzy looseness and enhanced by the sustained mood of quiet despair, soon became the property of everyone.